Less traffic congestions, more security and comfort, environmental sustainability and a variety of information and entertainment services – the future of connected cars looks very attractive. By 2020 the share of cars connected to the Internet worldwide is expected to be 22 percent. Nevertheless, there is a lot of work to do before the smart cars will be seen as a matter of course. But what are the main trends we can expect in the nearest future? Connected cars are vehicles that have an access to the internet that enables to share this connection with other devices like smart phone or even traffic lights. The driver of such car can receive real-time information about accidents, speeding or vehicle condition. In opposition to the connected cars a self-driving vehicle means completely autonomous detection of a driving situation and an action without any influence of human driver. 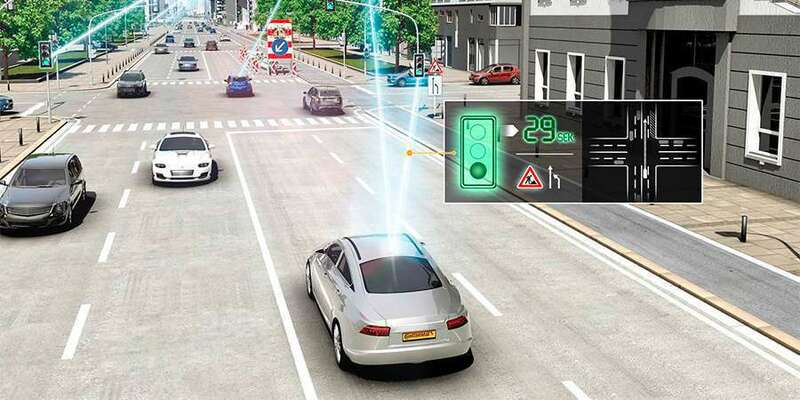 There are already advanced driver assistance systems available on the market offering safety features to avoid accidents like, for example, automatic parking, blind spot monitor or crosswind stabilization. In the future, an intelligent traffic control will enable to use optimally the capacity of the road infrastructure. The economic and ecological damages caused by traffic jams will be minimized. The accident risk caused by human errors will be largely eliminated. In addition, traditional taxis in big cities are forecasted to be replaced by driverless vehicles. The term ‘cars as a status symbol’ will end. In the future vehicles will be more personalized. The new technologies will be focused on providing access to different forms of mobility that will meet individual preferences of a user. Cars will be able to identify driver’s needs and adapt driving to them. For instance, it will be possible to transfer digital representation of a person from car to car. This technology will transform cars into high-intelligent personal assistants. Digitalization will provide new rules for automotive market that is currently on the way to the biggest transformation in the history. To survive in a high competitive environment, car manufacturers will have to deal with competitors from other business sectors and cooperate closely with network- and IT-providers. Also traditional component suppliers will be faced with the challenge to move quickly in order to continue development and become major players in the connected car supply chain. Buyers of new cars have high expectations, and they are related not only to the perfect quality, but also innovative functionality, reliability and security. For the reason, all players of the industry will have to bring together their experience and expertise to deliver mobility solutions that are not just car-oriented, but also integrate other transport modes. Due to the connected cars new business models will appear in B2B as well as B2C area. Especially the large amount of data from connected cars will represent a new source to make money. That’s why a big fight for this data is predicted for the coming future. The connected vehicles require processing and analyzing a huge amount of data. Car manufacturing companies will have to adapt their structure and put digitalization in the middle of their corporate strategy. One of the most significant challenges will be to process and analyze adequately the rapid growing amount of various types of data. Connected cars provide various benefits, but also represent an attractive target for cyber criminals that can hack the data, take control of the car and remotely turn on the brakes, for example. This ability provides threads for driver’s property and transport safety. That’s why the key objective of the involved parts responsible for the development of the car security solutions will be to work always one step ahead to avoid potential unauthorized vehicle access. Furthermore, clear industry standards and regulations to guarantee connected car security are highly required and needed to be discussed. All in all, we are moving towards an amazing high-technological future offering a wide range of exiting opportunities. Due to the cars connection with the vehicle infrastructure the traffic of tomorrow can be more secure and efficient. To keep roads safe it is important to give drivers full control over their personal data even if the car is doing the driving.